In a city as obsessed with history and tradition as London, it should come as no surprise that more than a few of the capital's weird traditions have a little booze involved. Or at least, take place somewhere usually reserved for drinking. Here are London's weird and wonderful drinking traditions. A tradition birthed by a tragedy. Or a supposed tragedy, as nobody has ever ascertained the veracity of the tale. Apparently a widow lived on the site where the pub now stands, alone as her only son served in the Navy. Every Easter, he'd dutifully return home for one of his mother's (presumably delicious) hot cross buns. Until one year — possibly during the Napoleonic Wars — he never came back. His heartbroken mother continued to bake a bun for him every year. In 1848, when her home was demolished to make way for the pub, a store comprising of dozens of these buns was discovered. The pub landlords decided to continue the widow's tradition, varnishing the old buns and hanging them from the ceiling, along with a new one each Good Friday (baked with the date on top). 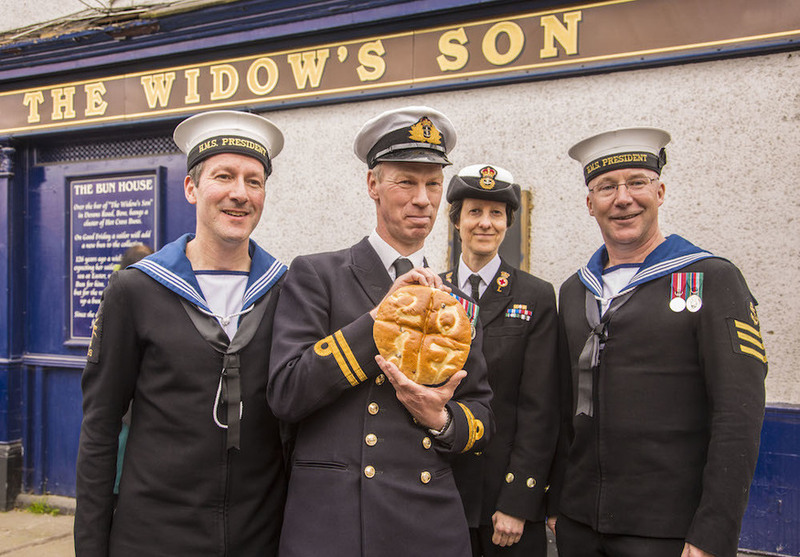 The honour of hanging the new bun now goes to a member of the Navy each year. Where: The Widow's Son, Bow. When: Good Friday, annually. A constructed Swearing on the Horns for a TV show called London Town, which filmed in the 1950s at The Flask. The Sphere, August 1950. Courtesy of British Newspaper Archive. You must not eat brown bread while you can get white, except you like the brown the best. And so on. At the end of it all, you're rewarded with the aforementioned pig-kicking-right, if you're in dire need of somewhere to sleep. There are few other bits of nonsense to speak and a few more "rights" earned by swearing on the 'magical' horns. Swearing on the Horns dates back hundreds of years, but throughout that time it's always been a bit slapstick. 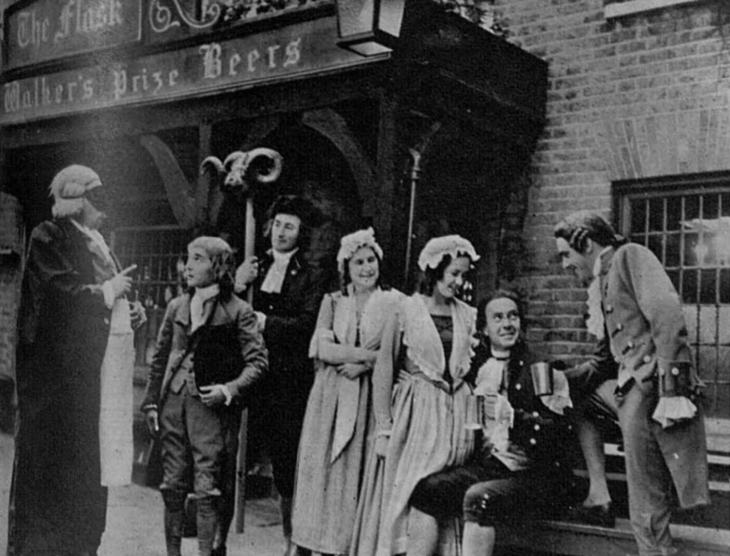 Nowadays it has a tendency to bounce around a few pubs in Highgate: The Duke's Head, The Wrestlers and The Bull have all held the ceremony in recent years. Where: Certain Highgate pubs. When: various. A blend of ancient midwinter customs and contemporary festivity occurs each January on Bankside. 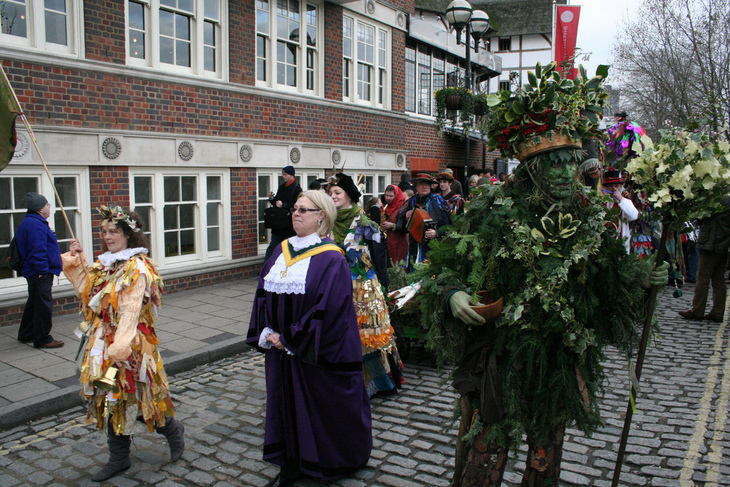 Things kick off outside Shakespeare's Globe with the Holly Man — the winter guise of the Green Man spotted across the nation's pubs. He's decked out in wonderful foliage and accompanied by the devil Beelzebub and other eccentrically-dressed associates who join together to Wassail (or toast) the people. There's singing, dancing and a play to enjoy before the crowning of a king and queen for the day. This royal pair lead everyone down to the 17th century George Inn. The fun doesn't stop there — at the pub, there's storytelling, more dancing, the Kissing Wishing Tree (your guess is as good as ours...) and, thankfully, mulled wine. Where: Outside Shakespeare's Globe and then onto The George Inn. When: Early January, annually. The Pineapple's Easter Bonnet competition launched in 1964 and despite taking a few years off, is still going strong today. It's a chance to flex your wacky creative muscles and create the most bizarre hat possible — a challenge that many participants readily accept. Lots of pub customs bring out an area's older, more traditional residents, but this does the opposite. Kids love nothing more than wearing fantastical costumes, and mad hats fall into that category. A word of warning — don't just glue a few random bits and bobs to a hat and expect to be crowned a winner. People take this thing seriously — a kid once turned up wearing a pterodactyl-inspired creature with a built in squawking mechanism. Where: The Pineapple, Kentish Town. When: Easter. Since the 1950s, waiters have dashed through the streets of Soho once a year, bubbly on tray, for the Waiter's Race — a sprint through the area in a bid to be the fastest, without spilling any of that precious booze. Back in the day, things were a bit more formal — see the 1959 footage below for immaculate tailcoats. The rules state that the race must be run in a waiter's work attire, and these days that often means t-shirts and trainers. Oh, and that bottle of champagne has been downgraded to a bottle of prosecco — we're not quite as extravagant as our forefathers. Other than that, the race hasn't changed since it began. This one isn't so easy to take part in — you have to be a waiter in the Soho area to participate. However, everyone is invited to watch, cheering on the competitors. Just be sure to give the waiters as wide a berth as possible — you don't want to ruin their shot at eternal glory. Or get any booze spilt on you. For many, Christmas centres around one feeling: loneliness. The Alexandra in Wimbledon wants to change that, so every Christmas Day it puts on a free Christmas lunch for people who'd otherwise be spending the day alone. People are seated together in an aim to get them talking and do away with festive loneliness. Christmas loneliness is often thought of as something that afflicts people in their later years, but The Alex serves anyone who comes through the door solo, no matter their age. In past years that has included a student who missed the last train home and an unfortunate soul who was dumped on Christmas Eve. Hidden away on one of Belgravia's cobbled mews streets sits The Grenadier. It's home to a tradition that people from all over the world have taken part in, even if they don't all know the story behind it — sticking signed banknotes to the ceiling. At first glance, it appears to be a monetary spin on a common tradition — there are plenty of bars around the world where tourists sign their names. However, there's a story behind what happens at the Grenadier that sets this apart. It's to do with the grenadier that gives the pub its name. This particular grenadier, named Cedric, played cards with his fellow soldiers. Cedric was a bit of a scoundrel, who cheated his way through games. Eventually he was caught, and beaten to death for his transgressions. Then came rumours that Cedric's ghost haunted the pub. The tradition of hanging money started as a way to pay back Cedric's debt, so his soul can move on — but alas, it's never enough, and to this day he apparently lingers. Where: The Grenadier. When: Make your contribution to Cedric's debt anytime the pub's open. Know any others we've missed? Let us know in the comments below.